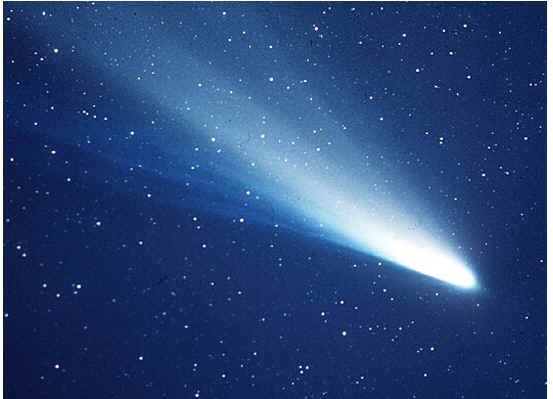 Comets are sometimes called dirty snowballs or "icy mudballs". Comets were born in the outer reaches of the Solar System, 4600 million years ago, when the planets were forming. Far from the Sun, they formed out of icy material as well as some rocky matter and this turned them into the 'icebergs' of space. 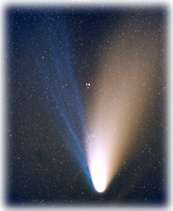 Only when a comet swings in towards the Sun does it begin to evaporate and generate the tails for which comets are so famous. When a comet's orbit brings it close to the sun, it heats up and spews dust and gases into a giant glowing head larger than most planets. The dust and gases form a tail that stretches away from the sun for millions of kilometers. Some comets take only a few years to swing around the Sun. Some – like Halley's comet – take much longer. Others appear once and are never seen again. 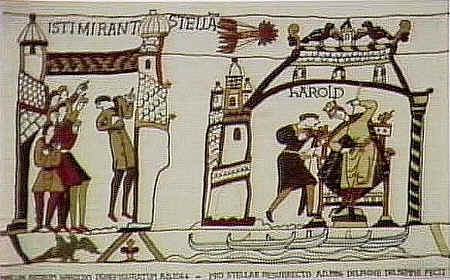 Some people in ancient times thought that a comet was a curse. To save himself from the "curse of the comet," Emperor Nero of Rome had all possible successors to his throne executed. 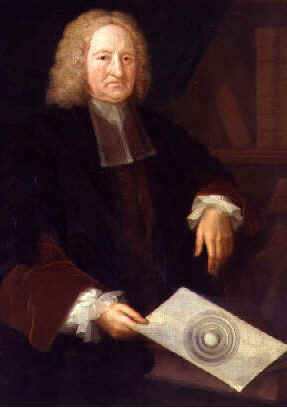 Edmund Halley of England studied comets and developed a theory suggesting that those sighted in 1531, 1607 and 1682 were actually the same object. He was the first to successfully predict the comet’s next appearance in 1758, but he died 16 years before the comet returned. 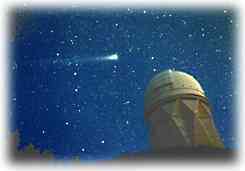 On January 30, 1996, Yuji Hyakutake (pronounced "hyah-koo-tah-kay"), an amateur astronomer from southern Japan, discovered a new comet using a pair of binoculars. In the spring of that year this small bright comet with a nucleus of 1.6 to 3.2 km (1 to 2 miles) made a close flyby of Earth — sporting one of the longest tails ever observed. The Hubble Space Telescope studied the nucleus of this comet in great detail. This is not Comet Hyakutake's first visit to the inner Solar System. Astronomers have calculated its orbit and believe it was here about 8,000 years ago. Its orbit will not bring it near the Sun again for about 14,000 years.